VIcky won the AVS Connect Award - this was awarded earlier in the year and provided financial assistance for a vet student to attend an international event. Sat in the presence of like-minded people, sharing the same passion for animals, yet having very different cultures and journeys to vet school, I had never felt a stronger sense of belonging. It was only earlier this year that I had first heard of IVSA, and I remember thinking to myself - it's time to get out of the Cambridge bubble. Before I knew it, I found myself procrastinating on the IVSA website and realising just how much I was missing out on. It all happened within a month: first being elected onto the UK & Ireland committee and becoming the Cambridge IVSA Junior Rep, then applying for the Congress and frantically researching where to obtain funding - student life! Fortunately I was honoured the AVS Connect Award and further grants from Clare College, so that I could comfortably confirm my place as a delegate. The hype did not stop as my inbox gradually received more updates and information packs about the forthcoming Congress. Before attending the Congress, I had little knowledge of what a General Assembly was. 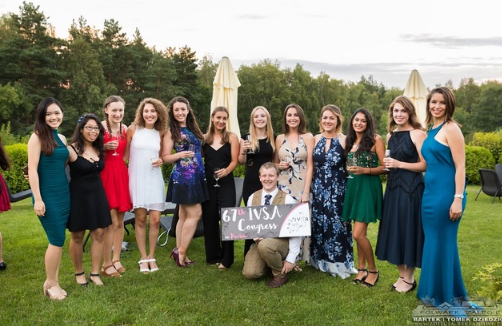 I learned so much from the first few hours of GA, from the impressive projects the Standing Committees had been working on, to the incredible global opportunities that we as IVSA members can undertake, not to mention the renowned IVSA "wobble" dance. Although there were times I was super knackered and the "amendments to the amendments etc" were quite tedious, it was amazing nonetheless, to be a part of the work in progress and to witness the flourish of IVSA. One of my most memorable trips was the visit to Zakopane. It was a stunning town in the country, complete with beautiful scenery. We also probably ate a day's worth of food at the hotel lunch buffet that day, but despite our food babies, we continued to have quality time in the swimming pool straight after. I felt like such a kid again, getting overly excited about a slide and a few floats. Attempting the wobble dance in the pool was also a ton of fun, even though I could barely touch the bottom - the struggle was real. After a beautiful night's sleep, we went on a hike in the gorgeous Tatra Mountains and managed to spot a wild bear amongst the bushes. During lunch we sat by the river, whilst one of the OC girls played her ukelele and sang for us - it was perfect. As always, time flew by and before we started to get to know each other properly it was the penultimate evening, the Official Dinner. It was definitely a highlight for me. Everyone looked so "priti" all glammed up. That night when the newly elected committee was announced and the organising committee delivered their speeches, I knew this experience was slowly coming to an end. Nevertheless, the following evening, the White Tshirt Party gave us the last opportunity to bid our farewells and dance the night away. Embarking on this Congress has been an eye-opening experience and undeniably one of the best decisions of my life. Importantly it has highlighted to me the significance of student wellness, through multiple workshops on self-care and stress management. Besides all the lasting memories created over the twelve days, I have not only met life-long friends, but also become a part of the most incredible IVSA family. I am very grateful for this experience and I encourage you guys to get involved in the numerous projects and opportunities IVSA has to offer, including the 67th IVSA Symposium in South Korea this winter!